In September 2018, Kamissa Camara has become Mali’s youngest foreign minister and the first woman to hold the post. One year ago, Camara wrote an open letter to President Ibrahim Boubacar Keita (IBK) to ask him to withdraw his plans to change the constitution. In July 2018, she became his diplomatic advisor and, shortly after his re-election, IBK appointed her as his foreign affairs minister. She is now one of 11 women — out of 32 ministers total — in Mali’s new cabinet. Camara says she aims to build political bridges with Africa. “My mantra is to enrich foreign policy with African accents. As an American woman who was born and raised in France by West African parents, I strive to provide analyses that highlight religious and cultural specificities. Politics, democracy, security and good governance are the essence of my work, reflections and publications”, she declares on her website. A fellow with the Center for African Studies at Harvard University and with Foreign Policy Interrupted, and founder and co-chair of the Sahel Strategy Forum, Camara gained reputation as guest speaker on Africa-focused panels with the U.S. Congress as well as with think tanks and universities in America, France and Africa. She previously worked as sub-Saharan Africa Director at PartnersGlobal and as Senior Program Officer for West & Central Africa at the National Endowment for Democracy (NED). She also worked for the International Foundation for Electoral Systems (IFES) where she was in charge of managing electoral assistance programs in sub-Saharan Africa and the Caribbean. 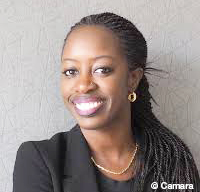 Camara holds a master’s degree in international economics and development from the University Pierre Mendès in France and a bachelor’s in applied foreign languages, specialising in international relations, from the Denis Diderot University.